Tomorrow marks the fourth anniversary of the bookshop blog, but you'd be forgiven for forgetting to wish it a happy birthday. Look down the list of blogs posted and you'll see I've not written about a bookshop for almost a month, and that on more than one occasion this year I've failed to stick to my one bookshop per week promise. For that I apologise. There's been no deliberate snub and this blog is definitely not finished, but since I sat down to write my manifesto so many years ago, my life has changed – in no small part as a result of this bookshopping hobby – and recently other commitments have had to, temporarily, take priority. and I can't easily post my annual photograph of how the book collection has progressed. Hopefully I'll remedy that in the near future. Meantime, some highlights from my past year of bookshop blogging have to be mentioned. There's the obvious one of my appearance on BBC Radio 4, but when it comes to bookshops, it's the less obvious moments that tend to be the most special. A game of hide and seek had me feeling like a child, while a tour around Portsmouth provided a variety of unexpected gems. I got to meet the second half of a pair of London bookshops, find out what all the fuss is when it comes to Terry Pratchett, and I had a beautiful surprise by the sea. There was also sadness, when I finally met a bookshop on its last day in business, two years after I'd first tried to visit. I can't tell you the tears I shed after that visit. Bookshops continue to be an important part of my life, places filled with wonder and welcome that even after all these years often appear in front of me at unexpected moments just when I need them most. I may not have written as frequently as I'd like these last few months, but my bookshopping has continued, and I'm just as excited to tell you about my recent visits as I was in the early days. Life is still slightly chaotic, but I promise normal (or relatively normal) service will resume. Thank you for your patience and for continuing to keep me company on this bookshopping adventure – and don't forget, if I'm quiet one week you're welcome to share your own stories too. PS. I may still be living out of boxes, but Dolly is very happy in her new home. 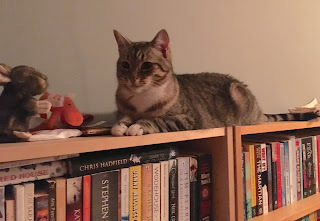 Here she is guarding what's visible of the bookshop blog shelves, while having a chat with a purchase from another much-missed gem.